Crystal tattoo carries a lot of energy. There are many different types of crystals, and each one of them has an individual meaning. Although, the most common types are diamonds, rubies, and topaz. 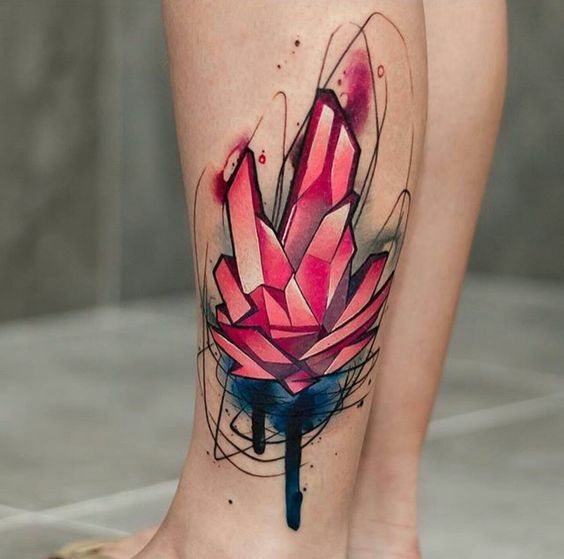 Usually, people choose to get a crystal tattoo when they know a lot about them. Often, they collect them or wear them as amulets. They also believe that it works like a charm and attracts good luck. Let’s take a look at the crystal tattoos and find out what do they mean. They are the strongest and most resistant materials on the earth. And because of that, they became a symbol of eternity. This perception also comes from the reflection of the crystal. When you expose it in front of the sunbeams, the glare begins to play on the stone, and it radiates a bright light. Because of this reason, people in ancient times worshiped the crystals. They also believed that they have the power to connect with the God of the Sun. In Buddhism, it is a symbol of a spiritual beginning. Also, diamonds adorn the throne and scepter of the Buddha. In many legends, the crystal appears with the heroes as a symbol of immunity from destruction. So, since the ancient times, many people believe that crystals have strange powers. And because of that, they carry them as amulets for protection and good luck. Another reason why many people choose the crystal tattoos is that the particular stone matches with the birth of their month. For example, the diamond is the gem that relates to April. Moreover, each stone also corresponds to the zodiac sign. So, before getting a tattoo, learn more about the particular crystal you want to get. Otherwise, you may end up having a stone with an entirely different meaning that you wanted. There are many different types of crystals, and each one of them has a different meaning. Although generally, they symbolize: unity, the power of the spirit, and persistence. All in all, if you don’t believe in all the meanings, it’s just a beautiful mineral. It will look great on your body even if you’re not into that all mystical stuff. So, take a look at our collection of these gems. You’ll find the inspiration here.